It was easy falling in love with Mushmina… long, flowing scarves swung from vintage brass hooks, with colorful handwoven pillows dotting the floor below. Brightly upholstered boho bags, heavy shag carpets, and antique jewels from far-away places beckoned us into their booth in the Handmade section of the New York International Gift Fair. It was like stepping into a Moroccan spice market. As we ooohed and aaahed at all the gorgeous treasures- stroking silky scarves and slipping into sandals- we were greeted by a pair of the warmest smiles we had yet to encounter at the show. Heather and Katie, it was obvious, really loved that they did and who they worked with. They shared sweet stories of sisterhood about the women who crafted their items by hand, giving their line a whole new sense of integrity. All at once we knew- we had to carry Mushmina at Nectar! Bea: What makes your products unique? Heather: Mushmina style is bohemian, colorful, and quirky. We are always changing, re-inventing, and highlighting traditional craft in our own way. The inspiration for our new line is the north of Morocco, Tangier, Chefchouen, and also weaving villages. For our Summer & Fall 2013 Collections we are working with rural women weavers, including Halima the weaver who made our very first handbags when Heather was in the Peace Corps. Our new collection was inspired by the handloomed striped cottons worn by women in the North of Morocco, colorful boucherouite ‘rag rugs,’ braided leather from Marrakech, and Berber-inspired adornment. Bea: What particular social initiatives and projects have you supported? 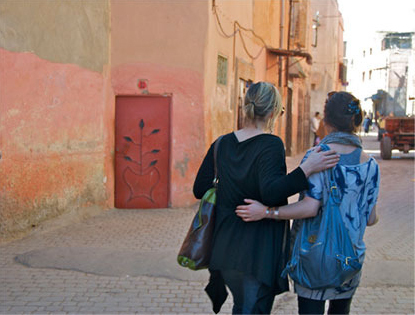 Heather: In Morocco we work with over 9 different artisan groups, employing over 85 artisans. A few of the superstar women’s cooperatives we help support include the women’s association of Arazane led by Rachida Al Korbani, Hafida Bouyou and The Embroidery Association of Oulmes, Tifaout Cooperative of Ait Ourir led by Latifa, L’Association, Kenza Jbilou and the women of Oued Zem, and D’Artisanat Des Femmes De Khenifra. Many of these women work in their homes, which are the center of Moroccan family life. We realized they are in need of a space to organize their work, to collaborate on ideas, and to train others. We just launched an Indiegogo campaign to establish this home away from home, and to fundraise for supplies and equipment for a women’s training center. You can watch the video and learn more about this important project and why we feel strongly about providing economic opportunities for women in North Africa here. Bea: What item from your line do you love and wear the most? Heather: What a great question! I have been wearing our Lucky Camel bag all summer. Perhaps many others are too, because we sold out of that bag! I also live in my circle hammered hoops in both silver and brass. They are my ultimate go-to earrings that go with everything. Katie is always changing it up, but her favorites are anything from our Sahara Collection. She can always be seen with a stylish stack of Sahara and Damascus bangles on her wrist. Bea: What advice do you have for other young female entrepreneurs? Heather: Our advice for female entrepreneurs is just leap! When you follow your passion, you will love what you do. Just be prepared to work late, rarely have a day off, and eat and breathe your new business. Everyone has a calling, so if your gut feeling is “I’m supposed to do this,” then do it! The not knowing how will start to disappear when you take action. Shop the latest Mushmina treasures here! !